A 15x10cm photo printer with a tiny footprint. It does not use conventional printer ink so the output is always dry when it emerges, it also prints onto postcards  remember them  so ideal to send from your holidays. It is 19x13x8cm when closed up. There is a 5x3.5cm TFT on top of the unit and this can be at any angle from horizontal (when it takes no space sitting on top of the unit) to vertical. The big increase in size when in use is the 13cm width this increases by 19cm in front when the postcard tray is loaded and you must also have at least 10cm behind clear as the card is kept perfectly flat and it goes through the machine from front to back on four passes before emerging finished from the front of the unit on top of the input tray. The paper and the ink role are sold together and while the cost may seem a little high remember these are the only things you need. Printing is quick at a genuine 36seconds from telling it to print an image viewed on the screen to a finished image emerging from the front of the machine after it's forth pass. There is a circle of seven buttons with a four position wheel in the centre that allows you some editing as well as to select the images to print. Two soft buttons are just in front of the TFT. There is one card slot on the left side that accommodate SD MMC or Memory sticks. The only other inputs are on the right side that's the power adapter and two USB connections one to perform as a 'Pict Bridge' socket and the other should you connect it as a standard printer to a PC. The 'Pict Bridge' socket is one of the more intelligent ones that can also read images from a pen/stick drive. I was impressed with the quality of the images and with the basic in machine editing that can for instance remove red eye prior to printing. The post card type photo paper are that bit thicker - to survive the post - and of course they would not work in other mini printers that bend the paper. They are also the micro perforation type. The actual sheets are 10cm wide and 18cm long 1.5cm from each end are the micro perforations and the actual image prints over these by around 1.5mm each end. The printing process is called dye sublimation and the 'ink' is on a film spread between two reels that fit into the base of the printer. There are a couple of other manufacturers that use this method often using a closed cartridge however while you should try not to touch the film no ink will transfer to your hands if you do. For anyone who wants to print a few images quickly then this could well be for you. For anyone wanting to send images (post cards) this certainly is for you. For those who print a lot then the cost of the ink and post cards may not make this cheap. Quality is good it reads the most popular card types (except XP) the Pict Bridge implementation is the intelligent type so pen/stick drives are catered for and of course you can use it from a PC. 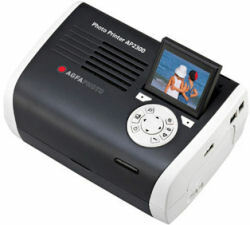 Doing my Internet searches found the Agfa Photo Printer AP 2300E at a best price of £99.99 from the first link below. ap2300......not attempting to take paper in but comes up with msg......insert ribbon parameter card .....help ???? ?